When you enjoy a stroll through historic Old Town you will see hundreds of examples of 19th century architecture. Take a sail only seven miles offshore and you and your family will experience North America’s only living coral reef. If you choose to tour the homes of Hemingway and Harry S. Truman, you will be thrust back into time. 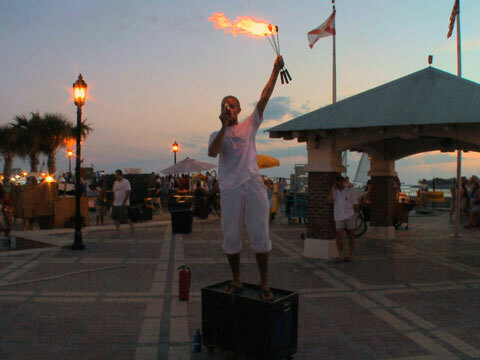 Take part in the sunset party every night on a Mallory Square or aboard a sailingcruise on the Key West harbor’s water. Don’t forget to visit some of the most amazing museums in the United States, and they are right here in Key West. Also, experience Key West’s heritage in dozens of art galleries, gifts shops, world class hotels and fine restaurants, all designed to suit every style and taste. Just walking down any street, is a photographer’s dream come true. Key West is visually rich in texture, unlike more modern travel destinations. Everywhere you look, you can imagine what you are seeing becoming a postcard from paradise. During the early morning hours as the sun is rising and during the evening hours when the sun is setting, you’ll see what is called by photographers and film makers “the golden hours.” During those times, everything is bathed in a rose like golden glow of sunlight. Some say it’s quality most closely resembles that found only in the South of France. According to the legend, if Key West sand gets into your shoes, you’ll return again and again. One of the many private beaches on the island, the Casa Marina, Flagler’s grand hotel resort. Free roaming chicken families are typically seen on most streets of Key West. Float viewing during The Fantasy Fest parade is the culminating event of the week-long event. A popular location is the La Concha Hotel. Sunset at Fort Zachary Taylor. Many visitors rent a bicycle and explore the history and architecture of Old Town Key West. Walking tours, including a tour of the unusual Key West Cemetery, are available. The Sunset Celebration at Mallory Square is a daily spectacle for visitors and residents. Boat excursions and tours provide a great way to view http://www.conchtv.com/key-west/key-west-chamber-of-commerce?rootcat=key-west&jcarStart=16from the water. The Duval Street bar and restaurant district includes many different entertainment options, all within walking distance of each other including Cowboy Bill‘s. The Studios of Key West, founded in 2006 and based at the island’s historic Armory building, was established as a new model for an artist community. It comprises a dozen working studio spaces, a main exhibition hall, sculpture garden, and several adjoining residencies and cottages. Its programming continues to grow, and includes an extensive series of creative workshops, free humanities lectures, cultural partnerships, and innovative ideas for artist and audience. Nobel Prize-winning author Ernest Hemingway’s former home is now open to the public as a museum, populated by as many as sixty descendants of his famous polydactyl cats.